I made this salad the other day. It is a old fashioned recipe. I remember my mom making it in the 70’s when I was growing up. It seems everyone loves it. Sorry about the pictures. My trusty camera bit the dust. Well at least the memory card did. I had pictures of all the ingredients and mixing. Not a lot to see, but what pictures I did take, were in the old camera, in the old memory card, that I cant get into. So I borrowed a camera and got another picture of the salad. That is before everyone ate all of it. I was not real happy with that camera anyway. I guess now is a good enough reason to get a new one. I will have to do some research. I cant get anything really high tech, because you know how I am. Keep it simple is my moto. I think that way is best for my camera and my food. 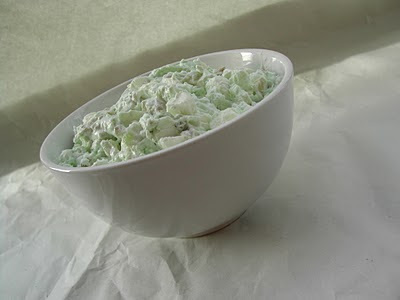 Just to let you know incase anyone is interested, Low fat and regular Watergate Salad is a registered trademark of the Kraft Corporation and they don’t mind sharing. Stir together the pineapple juice with the pudding mix until well blended. Gently fold in the Cool Whip and carefully stir in the pineapple, marshmallows, and nuts. 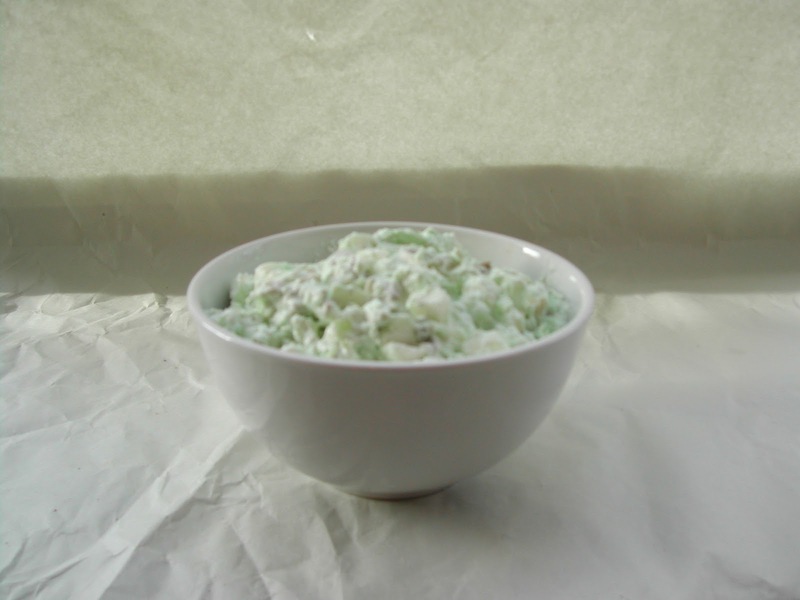 Cover and refrigerate at least one hour or preferably overnight. Oh I love this stuff. I make a slightly different variation but I also love the pistachio flavor. Perfect for a picnic!! A different version of ambrosia! Sounds so cool and refreshing! Oh my hubs will be all over that. Anything pistachio flavored! Thanks for sharing! I love your blog! I also love to cook! Aww Thanks Marina, I like creating things for friends like you to enjoy! This salad is an oldie but goodie! Thank you for sharing your words and this recipe! And thank you for your sweet thoughts on my blog. I appreciate you!